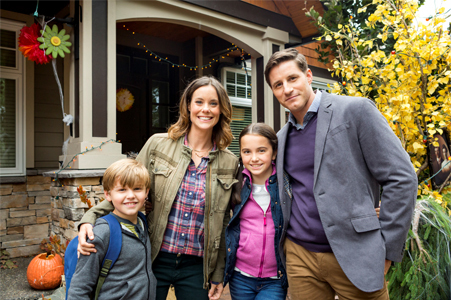 HALLMARK'S Irresistible "FALL HARVEST" Flicks - Kick Off this First Weekend of OCTOBER!!! *Plus, Chesapeake Shores & More!!! *SEE MY INTERVIEW WITH ASHLEY WILLIAMS - HERE! 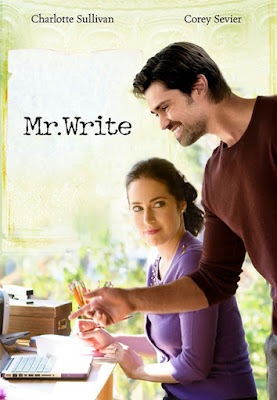 on the Hallmark Channel at 9pm/8c. 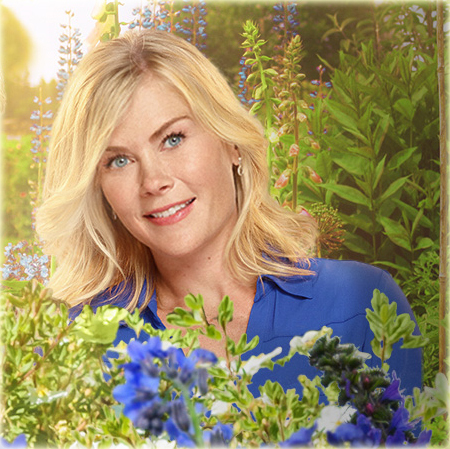 *SEE MY INTERVIEW WITH ALISON SWEENEY - HERE! on Hallmark Movies & Mysteries at 9pm/8c. INTERVIEW: Actress Alison Sweeney - All the Juicy Details on her new Hallmark movie "The Irresistible Blueberry Farm"!!! I am thrilled to share with you all today - my Interview with well known actress, author, and host, Alison Sweeney! Many of you adore her, as I do, in Hallmark's "Murder She Baked" Mystery series, as baker Hannah Swensen. This time around, Alison has cooked up something new and brought the book: The Irresistible Blueberry Bakeshop & Cafe by Mary Simses, to Hallmark, where they worked together and turned it into the movie: "The Irresistible Blueberry Farm"! Alison Sweeney in "The Irresistible Blueberry Farm"
Here's a synopsis of "The Irresistible Blueberry Farm", via Hallmark: "High-powered Manhattan attorney, Ellen Branford (Alison Sweeney), is going to fulfill her grandmother’s (Shirley Jones) dying wish—to find the hometown boy she once loved and give him her last letter. When Ellen leaves her Kennedy-esque fiancé, Hayden Croft (Kavan Smith), to go to Beacon, Maine, she expects to have a quick twenty-four-hour stay. But a near-drowning experience leads her to become a local celebrity and introduces her to a man named Roy (Marc Blucas), a carpenter who saves her life. As Ellen learns more about the past her grandmother has kept hidden and works to bring closure to her quest, she may find that a twenty-four-hour visit to Beacon will never be enough." 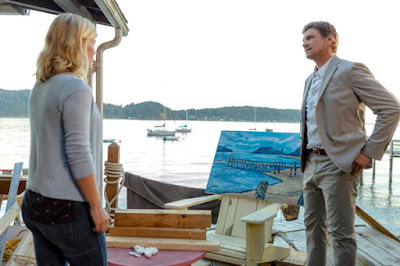 Alison Sweeney and Marc Blucas in "The Irresistible Blueberry Farm"
Alison Sweeney: ELLEN IS A GREAT EXAMPLE OF A WOMAN WHO THINKS SHE’S HAPPY UNTIL SHE FINDS REAL HAPPINESS IN AN UNEXPECTED PLACE THAT CHANGES HER LIFE, HER PRIORIRITES AND SHOWS HER TRUE HAPPINESS. Alison Sweeney and Shirley Jones in "The Irresistible Blueberry Farm"
Net, It's a Wonderful Movie: What was it like to work with your co-stars: Marc Blucas (“Operation Christmas”) and the amazing Shirley Jones (“The Music Man,” “The Partridge Family”)? Alison Sweeney: WHEN WE CAST SHIRLEY JONES TO PLAY MY GRANDMOTHER, I WAS ECSTATIC. I’VE ALWAYS BEEN A HUGE FAN OF HERS AND, NOW HAVING WORKED TOGETHER, I’M AN EVEN BIGGER FAN. AS FOR MARC, HE WAS A DREAM – WE HAD A BLAST TALKING ABOUT BASKETBALL AND THE ‘80S, LEARNING SWING DANCING AND FINDING THE CONNECTION BETWEEN OUR CHARACTERS. THE CAST WAS ALL INCREDIBLE TO WORK WITH AND I MISS SEEING THEM DAILY. Cast in "The Irresistible Blueberry Farm"
Net, It's a Wonderful Movie: Since the title of your movie is “Irresistible Blueberry Farm”, and I know you have shared your love of blueberries (I love ‘em, too!) on Instagram… How important, overall, is healthy eating & exercise to you – with your busy schedule? Alison Sweeney: I WOULDN’T BE ABLE TO MAINTAIN MY BUSY LIFESTYLE WITHOUT BEING HEALTHY. OVER THE YEARS, I’VE LEARNED HOW IMPORTANT IT IS TO EAT RIGHT, WORK OUT AND GET PLENTY OF REST. 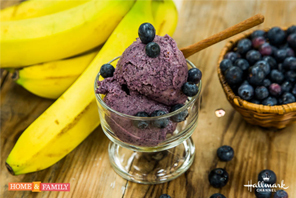 WITH BLUEBERRIES, I CAN ALWAYS HAVE A FRESH BOWL IN MY REFRIGERATOR AND DRIED ONES IN MY FREEZER AND KNOW THAT I HAVE A HEALTHY GO-TO SNACK READY AT ALL TIMES. Cameron Mathison, Alison Sweeney, and Gabriel Hogan in "Murder She Baked"
Actresses Barbara Niven, Alison Sweeney, and Lisa Durupt in "Murder She Baked"
Net, It's a Wonderful Movie: You are, of course, well known from your role on “Days of Our Lives” as Samantha "Sami" Brady, but I must say how much Hallmark fans (including myself!) 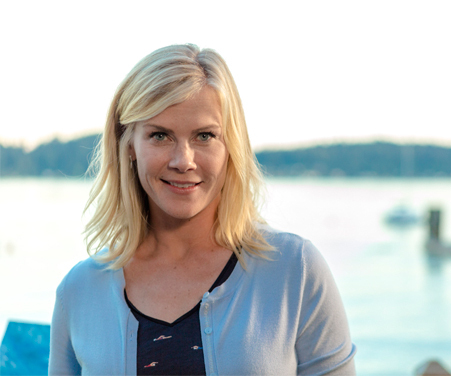 enjoy watching you in the on-going Hallmark Movies & Mysteries series “Murder She Baked” as baker Hannah Swensen! When I interviewed Cameron Mathison and Lisa Durupt for “Murder She Baked,” they both spoke very highly of working with you. Please share what it is like to work with them and Barbara Niven, who portrays your "caring" Mother, plus Gabriel Hogan, Toby Levins, and Juliana Wimbles! Any clues as to when we might be able to see the next “Murder She Baked” on Hallmark? 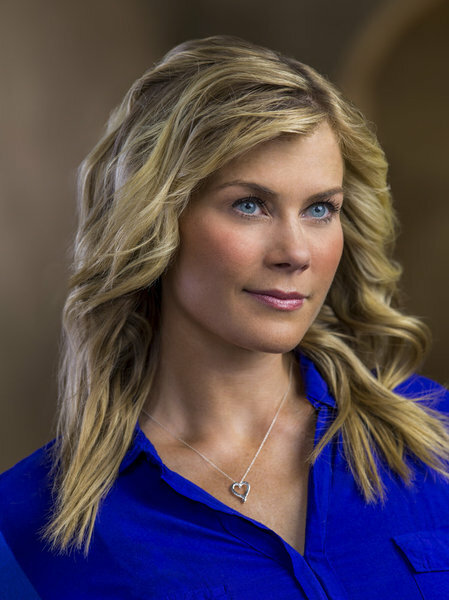 Alison Sweeney: SO GLAD YOU’RE A FAN TOO! WORKING WITH EVERYONE ON MURDER SHE BAKED HAS BEEN FANTASTIC. I’M SO FORTUNATE TO CONSISTENTLY HAVE PROJECTS WHERE I’VE GOTTEN TO WORK WITH SUPPORTIVE ACTORS THAT BECOME FRIENDS. I’M A FAN OF THEIR WORK AND OF EACH OF THEM PERSONALLY. 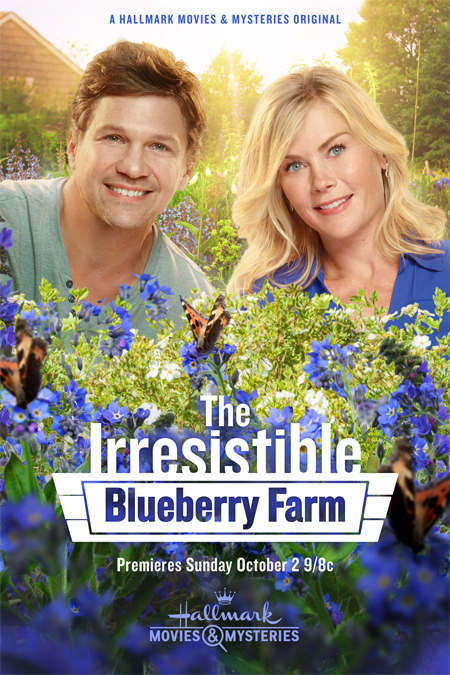 Net, It's a Wonderful Movie: Incredibly, “The Irresistible Blueberry Farm” will be your seventh Hallmark movie! How is this one different than your other projects? Do you plan or hope to do even more Hallmark movies in the future? Alison Sweeney: WITH THIS PROJECT, AND LOVE ON THE AIR, THEY WERE BOTH PROJECTS THAT I SOLD TO HALLMARK SO THERE WAS AN ADDED LEVEL OF RESPONSIBILITY IN THE DEVELOPMENT PHASE. WITH ALL OF MY PROJECTS, I’VE LOVED BEING A PRODUCER AND STARRING IN THEM BECAUSE OF THE GREAT STORIES, CHARACTER DEVELOPMENT AND FEEDBACK THAT THE FANS GIVE ME. I HOPE TO FIND MANY MORE OPPORTUNITIES TO WORK WITH THE CHANNELS ON ROMCOMS AND CONTINUING TO ENTERTAIN THEIR VIEWERS AND MY FANS. Net, It's a Wonderful Movie: Do you have a favorite scene or memorable filming moment in “The Irresistible Blueberry Farm”? Alison Sweeney: I HAVE TO SAY THAT THE STUNT OF FALLING IN THE OCEAN WAS SO MUCH FUN. IN SPITE OF THE FREEZING WATER, I COULDN’T HAVE IMAGINED SOMEONE ELSE DOING THAT FOR ME WITH MY BEING DRY (AND WARM) ON THE SIDELINE. 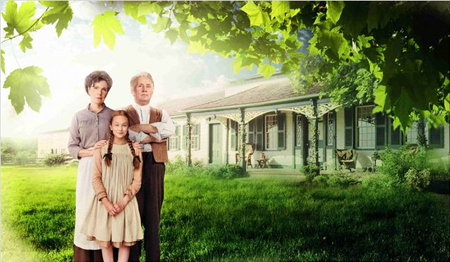 Net, It's a Wonderful Movie: What does it mean to you – to create movies that families can watch together on Hallmark? Alison Sweeney: AS THE MOTHER OF YOUNG CHILDREN AND A FAN OF FAMILY VIEWING, MAKING MOVIES THAT MY KIDS CAN WATCH WITH ME IS VERY IMPORTANT. THESE MOVIES AND MY UPCOMING SPECIALS FOR FOOD NETWORK ARE EVEN MORE SPECIAL BECAUSE I CAN WATCH THEM WITH BEN AND MEGAN. Alison Sweeney: WITH EVERYTHING GOING ON IN THE WORLD, I HOPE VIEWERS ARE GIVEN A CHANCE TO TAKE TIME TO BE ENTERTAINED WITH A FUN ROMCOM. I’LL BE ON TWITTER AND FACEBOOK SO I HOPE THEY LET ME KNOW THEIR FAVORITE PARTS! for doing this interview with me at “It’s a Wonderful Movie”! It has been such a delight to have this opportunity to chat with you! We look forward to this Hallmark movie project and many more!!! You were very brave to do your own movie stunt... we'll be certain to keep a look out for it in the movie! I'm totally with you, on keeping active and living a healthy lifestyle. I always feel my best and work my best - when I fuel my body with wholesome, healthy foods... that's why I loved the recipe you shared this week on Hallmark's Home & Family. Here is the recipe (below), with an extra recipe- for all of you, who love blueberries, too...! Combine in a powerful blender or food processor. Alison Sweeney host and judge on the all new "Kids Halloween Baking Championship" when it airs Wednesday, October 5 at 8pm ET on Food Network! when it airs Sunday, October 2 at 9pm/8c. INTERVIEW: Actress Ashley Williams - Shares Behind-the-Scenes of Making a Hallmark Movie & Much More!!! Recently, I had the wonderful opportunity to interview actress Ashley Williams! In my Q&A with Ashley below, we talked all about her upcoming New Hallmark Movie, her Co-stars in the film, working with her Famous Sister, potential, still secretive Upcoming Hallmark Movie projects, her Favorite Season, and so much more!!! Actress Ashley Williams in Hallmark's "Love on a Limb"
Ashley Williams has also starred in several Made-for-TV movies, many of us have enjoyed over the years, including: "Snow," "Snow 2: Brain Freeze," "Scents and Sensibility," "Christmas in the City," and Ashley's first Hallmark Movie "October Kiss!" (The 3 Movies above starring Ashley Williams are all Available on DVD! Once again, Ashley Williams will be starring in an All New Made-For-TV movie, a Hallmark 'Fall Harvest' Film, titled "Love on a Limb!" Net, It's a Wonderful Movie: Welcome Ashley to 'It's a Wonderful Movie' - where we chat all about movies on TV! 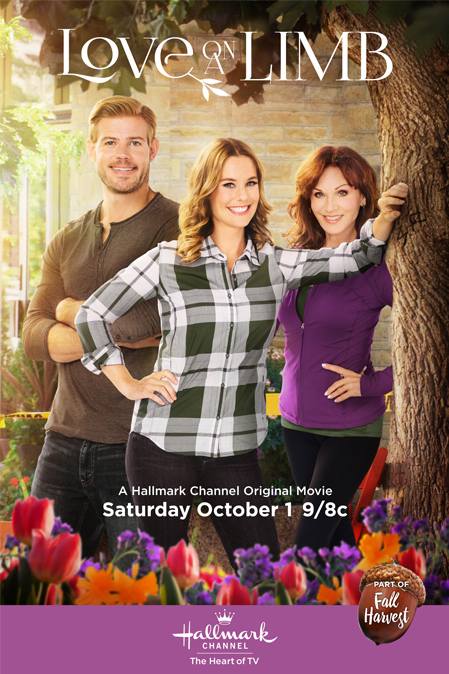 Please share with us the plot details of your Hallmark movie “Love on a Limb”. I understand this story was based on a real-life situation. Do share! Ashley Williams Thank you for having me on here and for supporting our movie— you guys are going to love it! Love on a Limb is about a passionate woman, Aimie Roarke, who hears that a beautiful old tree in the center of town, where children have taken their first steps and men and women have gotten married, is going to get cut down due to the cost of repairs on the pipes that run alongside the roots. In protest, Aimie climbs up into its branches and wont come down until the city grants that the tree be allowed to stay right where it’s been for 150 years. The man on the ground who has been hired by the city to cut it down (Trevor Donovan) just happens to be a sensitive, charming pacifist… and GORGEOUS. The standoff results in the two connecting in surprising ways. But I’m not going to tell you any more! It’s too delicious. The idea for Love on a Limb came from several different places. I was inspired, along with my writers, Erik Patterson and Jessica Scott, by the moving protest by Julia Butterfly Hill to save the redwood tree in the late nineties. Additionally, a tree in Jessica’s hometown of Orange CA, affectionately named “The Big Old Tree” was going to be cut down and the whole town gathered in protest. We used those stories in order to paint a larger picture: men and women can often be brought together by a good old-fashioned healthy disagreement. Something I think all of us can relate to! Net, It's a Wonderful Movie: Fans enjoy watching you, Ashley, because you have such an effervescent personality – light and cheerful, that always shines through all your roles. Please tell us about your character, Aimie Roarke, in “Love on a Limb”… she looks like she’s a lot of fun in the previews! Ashley Williams Aimie is loosely inspired by one of my closest friends, Aimie Billon. Real life Aimie is tireless, kind, sensitive, and determined. Every time she takes a walk she ends up rescuing a dog and then works nonstop until she finds it it a home. Her career in a philanthropic agency, Propper Daley, is really taking off and I’m so proud to be her friend and watch her affect change in the lives of others. This character has the same work ethic and feeling of responsibility to the betterment of the world. One thing I haven’t mentioned is that real life Aimie is hilarious. We never stop laughing. Her honest and self-deprecating nature, make her a joy to be around, and we worked hard to bring that humor in. The audience is going to love this character. 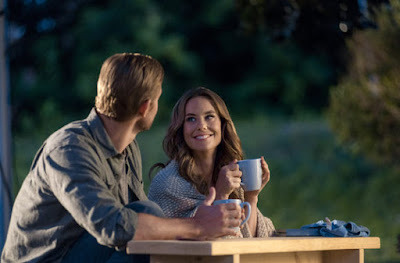 Trevor Donovan and Ashley Williams in Hallmark's "Love on a Limb"
Net, It's a Wonderful Movie:You have two amazing, well known Hallmark stars co-starring with you in “Love on a Limb”. What was it like to work with the handsome Trevor Donovan (J.L. Family Ranch) and the energetic Marilu Henner (Aurora Teagarden Mysteries)? Ashley Williams What an incredible cast! I still cannot believe we landed these two stars. As soon as I met Trevor Donovan we immediately started giggling and making silly faces, which fed right into a really playful and spontaneous chemistry in our work. We aimed to develop a patter with these characters similar to Bruce Willis and Cybil Shepard in Moonlighting – whip smart banter and competitive witticism. It’s was SO MUCH FUN. After each take we’d jump up and down and say, “let’s do it again! !” I’d kill to work with Trevor again. PS. you guys I worked so hard to try to find a place where it made sense for Trevor to take his shirt off. No luck. I need to hire him again so I can make that happen! And Marilu!! The one and only Marilu Henner. I waited a while into shooting before working up the guts to ask her about what it was like doing Fosse on a Broadway stage (Marilu did like a million performances of Chicago) because I didn’t want to completely nerd out. She is a legend and I am in awe of her career. And her infamous memory is the real deal. She really helped me. I was dealing with a two year old going through a sleep regression, producing my first movie, and acting in almost every scene. Marilu tracked continuity and logic in the movie that I never would have been able to completely have my eye on. We could talk for hours—I miss her and can’t wait to watch her on Dancing with the Stars!!! 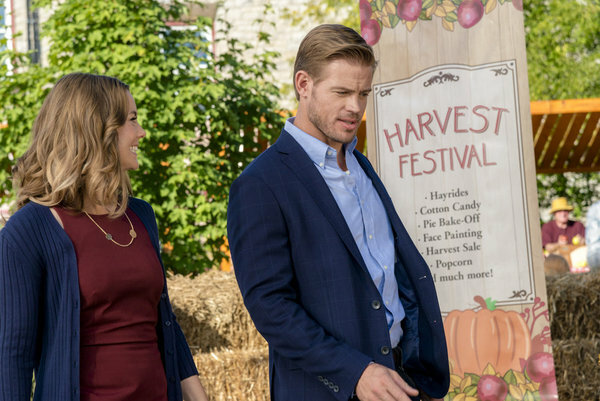 Ashley Williams and Trevor Donovan in Hallmark's "Love on a Limb"
Net, It's a Wonderful Movie: This is your second Hallmark “Fall Harvest” themed movie following “October Kiss”. (Which we all loved, by the way!) For devoted Hallmark viewers, you are now the star of Fall. I must ask, however, what is your favorite season? Ashley Williams Spring! My favorite season is Spring! Growth and blooming and first time bare feet are my jam. Fall is gorgeous, especially on the east coast where I just moved, but I actually have to work hard in the fall to not get sad with the sun going down and things starting to get cold. I usually schedule things in the evening—a dance class or…. A fun movie to watch to keep my spirits up! This one is definitely going on my docket. Net, It's a Wonderful Movie: I am extremely close to my sister, so I think it’s very special that you and your sister (Kimberly Williams-Paisley) are both actresses, who have both been in Hallmark movies. Did you do plays or perform for family, as you were growing up? Have you ever acted in anything professionally or otherwise, together? Ashley Williams I love my sister. We are so close. Kim and I worked on a tiny little short film, along with the rest of my family, that made it into a bunch of shorts festivals. I loved working with her and (shhhhhh!) I’m actually working with my writers on drumming up an idea for her to star in a Hallmark movie for me to produce! It’s in the tiny baby stages but you’ll hear about it in a bit. Believe me, I’ll keep you posted! Net, It's a Wonderful Movie: Do you have a favorite scene or memorable filming moment in “Love on a Limb”? Ashley Williams I loved shooting in the tree! It was actually really comfortable and my stunt coordinator made me feel really safe by tethering me with a cord to the branch so I wouldn’t fall. It was August when we were shooting and a lot of the scenes took place at night. In between takes I chose to stay in the tree and I got to look down with pride at the awesome crew that I’d hired, working their butts off below me, and then look up at the stars and hold caterpillars in my hands. It’s was magic. in Hallmark Channel's Fall Harvest Family Movie "October Kiss"
Net, It's a Wonderful Movie: What does it mean to you – to create movies that families can watch together? Ashley Williams I’m heartbroken by the world today. I work to educate myself on the news-- the injustice, the racism, the hatred, the violence, and I have strong feelings and positions on where we are in this country and globally. BUT, then, what an absolute gift it is to be able to turn the channel and watch someone’s dreams come true in a Hallmark movie. Hallmark has created a specific genre that is a joy to escape into at a time when I think we really need it. Net, It's a Wonderful Movie: What do you hope viewers will take away from watching your Hallmark movie “Love on a Limb”? Ashley Williams I want the viewers of Love on a Limb to be able to turn off their lives this fall for a moment, just a moment, of fun, calm, satisfying storytelling. Please make some popcorn. Wrap yourself and your seven year old in a yummy blanket on the couch. Perhaps it’s your first fire of the year! Make a night of watching our joyful little story of a woman standing up for what she believes in and finding true love for the first time. And tell your friends, children grandparents to do the same. It’s something the whole family will truly enjoy. Thanks so much for your support! Actress Ashley Williams with Cast in Hallmark's "Love on a Limb"
for doing this interview with me for 'It's a Wonderful Movie'! You are always an absolute joy to watch and it was just as much fun to have this interview chat with you! 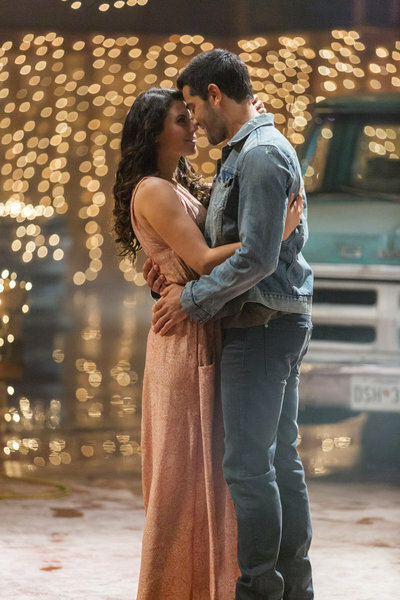 I do hope, since Spring is your favorite season, we can talk Hallmark into giving you a "Spring Fling" movie next year, and (whispering) I know we all will be extra excited to hear more about your upcoming project with your sister, Kim, but we'll keep that completely secretive and under wraps - for now! For even more details on Ashley's new movie, visit my page: "Love on the Limb," for movie images & more!!! The 2016 *Christmas TV Schedule* is Up... 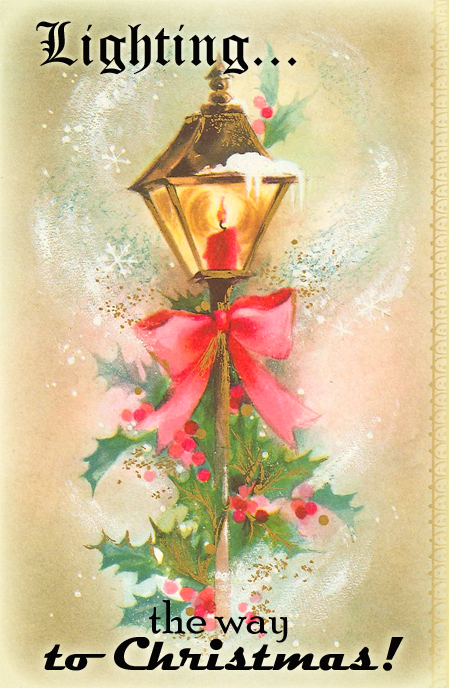 Lighting the Way to Christmas!!! On this day, we are one month away from Christmas Movies starting October 28, 2016, on both Hallmark Networks - the Hallmark Channel and Hallmark Movies & Mysteries at 10 pm (eastern standard time). with all the Christmas Movie Premieres we know so far, and more... You'll have to check out the schedule and see!!! Always know, if you hear any news, please be sure to leave a comment or e-mail me at: itsawonderfulchristmas@yahoo.com! I hope you all enjoy this sneak peek at Christmas Movies to come!!! PLOT: A retelling of L.M. 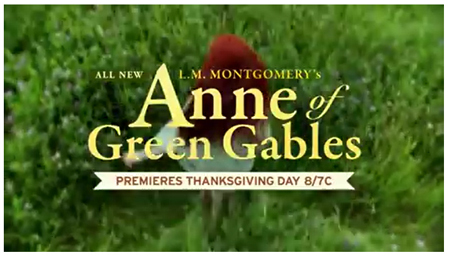 Montgomery's story of Anne Shirley, an orphan who is accidentally sent to a couple looking to adopt a boy instead. 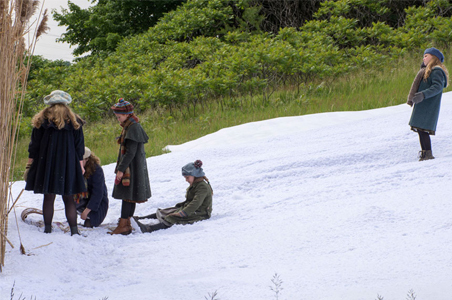 "Both movies are based on beloved children's novels that revolve around orphaned characters and their new beginnings. 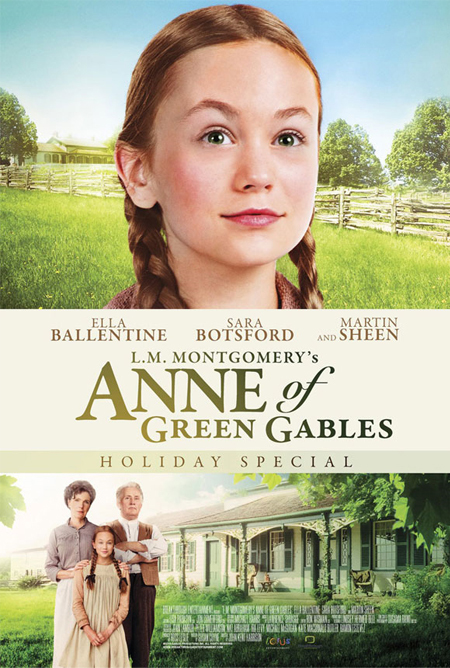 As fans know, Anne of Green Gables tells the story of adventurous Anne who is sent to live with Matthew and Marilla Cuthbert, a strict sister and a fun-loving brother." "These two films are great examples of the quality, family-friendly programming PBS strives to provide during the holiday season and all year long," Beth Hope, PBS's Chief Programming Executive said in a press release." This is an extra sweet, delightful family-friendly movie! 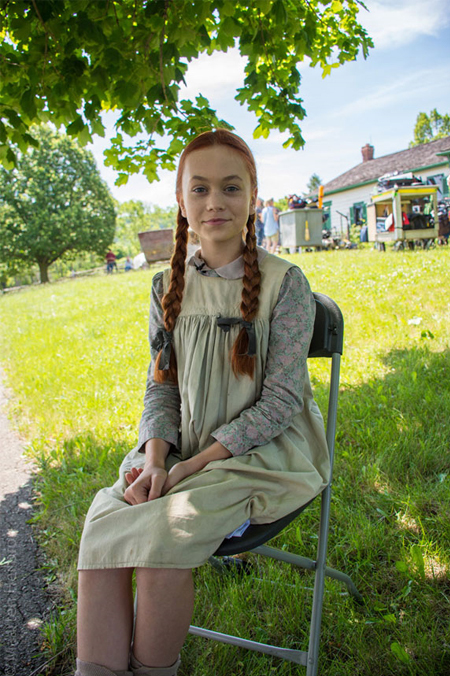 If the young actress pictured above, Ella Ballentine (who portrays Anne Shirley), looks familiar to all of you Hallmark fans, then you are right! She portrayed the young girl, Karen, in the Hallmark Christmas Movie, "Baby's First Christmas." 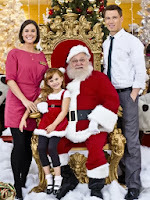 I was also honored at that time, to interview young Ella before the premiere of her Hallmark Christmas movie! You can see that Interview, HERE!